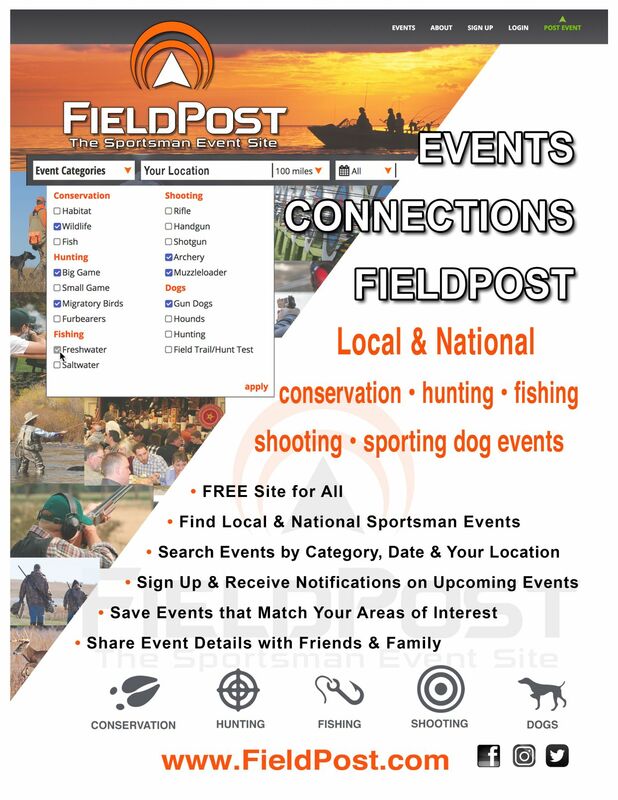 Thank you for becoming a FieldPost Member! We are excited to connect you with your next sportsman experience! If you have any questions or would like to learn more about FieldPost, please contact us. The email address you provide will receive weekly notifications on upcoming events that match your Preferred Location and Areas of Interest. The location entered will be used to match any posted events that are located within a 100 mile radius of your Preferred Location. You can change your Preferred Location any time you like. Member must have a Preferred Location entered and at least one Area of Interest selected. Email will include a list of events that have been posted in the previous week within 100 miles of Preferred Location. Member will not receive a notification email for that week if the criteria stated above is not met. Please check all categories that you find interesting. When your interests match an event, then a connection is made! You can change your Areas of Interest anytime you like. Be sure to Submit when you sign up! Also, select Update if you make changes to your Profile. You must LOGIN as a Member to access your Dashboard and Profile. Selecting SAVE THIS EVENT on the Event Detail page will save the event to your Dashboard. Saved events will remain on your Dashboard until the event either expires or you 'remove' it. All fields can be updated; however, be sure to select Update before leaving the page. If you are logged in and leave the site, you will remain logged in until your next visit.